This dictionary scavenger hunt is a fun game for your kids to play while you sneak in a little learning! Searching through the dictionary may not be your child’s idea of fun – but maybe you can convince them to do a little dictionary reading if it’s for a fun game. 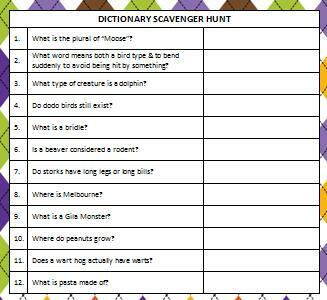 This dictionary scavenger hunt (click here for the free printable) is a fun way for your kids to familiarize themselves with the dictionary and learn what kind of information they can find in it. Is a beaver considered a rodent? What is the plural of moose? What is a Gila Monster? Do dodo birds still exist? The answers to all the questions are included on the free printable dictionary scavenger hunt. For a family game night, you could also use the dictionary for your own family spelling bee. Simply open the dictionary to a random page and each person can take a turn choosing a word for another family member to spell. You can use a bell to ring when the spelling of the word is correct and perhaps a bike horn to sound when the spelling of the word is incorrect. You can also use the dictionary for a fun definitions game. Have each person take a turn as the reader. The reader would then open up the dictionary and choose a word. The other players will all get a chance to guess at the meaning of the word. There are so many words in the dictionary that this is sure to be a difficult game. The kids are sure to love confusing parents on this game by using some tricky and uncommon words to define. Do you still use a printed dictionary or do you only use an online version? We have so many fun ideas and freebies to share with you! Follow along on Facebook, Twitter, Pinterest and Bloglovin’ for the latest ideas. Don’t forget to check out our Free Printable Games page for more freebies. Great idea! Enjoy your SITS day! I did this ALL the time to challenge myself as an only child growing up! It was super fun. I would add lil challenges for myself like learn 5 Words that start with the letter…Q! Trust me as a child it’s fun & hard! Then, I’d use them in a sentence. I LOVED words–still do 😀 First time visitor of your blog and love it here already. Thanks for sharing so many super printables & ideas! Thank you so much for your comment, Jeanine! Sounds like you had quite the creative mind growing up!